Spruce trees are coniferous (needle-leafed) evergreens. There are about 35 species in the genus Picea, native to the northern hemisphere. The name spruce is from the Latin pix, meaning pitch. These trees often live to a very old age. The oldest spruce on record is a Picea engelmannii that reached 852 years and is still thriving. The Norway Spruce, a European native, was probably the original Christmas tree. 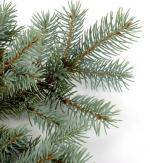 The Blue Spruce is the state tree of Colorado and Utah, plus the U.S. National Christmas Tree is also a Blue Spruce. 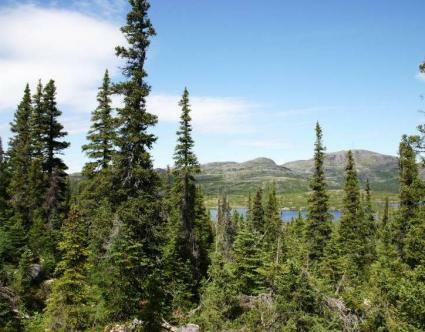 Spruce trees are large, with some species maturing up to 200 feet tall. They have a strongly conical shape, especially when they are young. The branches are quite rough, showing small bumps where old needles have shed. Blue spruce trees have thin, rather scaly bark and pendulous cones. The needles are at nearly right angles to the branch and have extremely sharp tips. Blue spruces mature to a 50- to 75-foot height with a spread of about 25 feet. This tree is admired for its beautiful silver-blue color. The Norway spruce tree is a deep, bright green. The needles are quite square when a cross-section is examined. They have the longest cones of any spruce, up to 6.5 inches. Some weeping forms have been developed for landscape use. Picea abies grows well in full sun and cool temperatures. It is best in acidic, sandy soils and it prefers good drainage. This spruce tree grows quickly and transplants easily. Picea pungens grows best in full sun. It is tolerant of a wide range of soils and prefers average moisture. It has some tolerance for both flooding and drought. Blue spruces are hardy in zones 2 to 8 and grow at a slow to medium rate. Spruce trees are grown as screens, windbreaks, and specimen plants. They are admired for their year-round color, symmetrical growth pattern, and conical shape. Blue Spruces and Norway Spruces are popular Christmas trees and both have dwarf forms that can be grown in small gardens. Norway spruces are widely planted to replace forests. Spruce forests are often cultivated for paper manufacture. The long fibers of spruce wood are especially suitable for this purpose. Spruce wood, which is sometimes called whitewood, is used for a variety of purposes ranging from general construction work and crating to the bodies of stringed musical instruments and wooden aircraft. Traditional uses include using the resin to make glue and pitch; the saplings for snowshoe frames and bows; the bark for cooking pots and trays; the roots of some species for baskets; and decayed wood for tanning. The needles and branches have been used to brew beer. The spruce beetle is the most dangerous pest for Picea. The spruce gall aphid and the spider mite can also be troublesome. In general, however, spruce trees have little trouble with pests and diseases. For a Victorian view of these trees, see Spruce Fir.